Workshops targeted at teenagers aim at sensitising young people to discrimination of the intellectually disabled and at underlining the need for acceptance of such persons. Our programme, by means of a film made especially for our project, “Jestem” (“I Am”), in a simple manner proves how many things the disabled and the non-disabled have in common and how many activities can be undertaken collectively. Thanks to the workshops, teenagers familiarise themselves with “otherness” and learn the basic facts about disabilities. The participants will have an opportunity to meet some intellectually disabled persons and to take up some activities (of their own invention) involving the latter group. The workshop duration is 45 min. and it is lead by two instructors (Stanisław Jabłonka Przyjazny Dom Foundation’s and L’ARCHE Foundation’s employees), accompanied by a person with some mental health condition. Each session includes a discussion based on the “Jestem” film, as well as group work, a multimedia presentation and drama elements. The participants will have an opportunity to become volunteers and to take part in mutual initiatives with the disabled members of our Foundations. The most active volunteers will be invited to accompany them during an integration camp. We conducted 53 workshops for teenagers (31 provided by Stanislaw Jablonka Przyjazny Dom Foundation and 22 – by L’ARCHE Foudnation), with the total number of 1014 beneficiaries from dolnośląskie and małopolskie voivodeships. Many participants overcame their fear of people with mental health conditions. 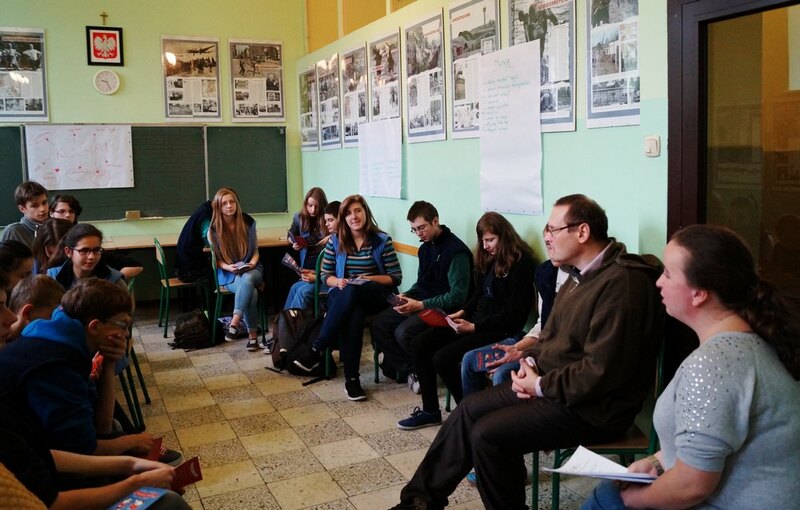 Their first reciprocal contact during workshops in schools proved to be a springboard for starting closer relationships, voluntary work and mutual initiatives. One of the greatest outcomes of getting the disabled persons involved in conducting workshops at schools was the fact that, in this way, these people also had a chance to face their fears by opening up to students. They engaged themselves eagerly and generously, even though it was a new and stressful situation for them. We recognise that there is a great need for continuing such educational programmes among children and teenagers. The project carried out by us confirmed that our workshops helped not only to refute stereotypes and overcome fears and barriers, but also to experience sincerity and good-heartedness in relations based on understanding, acceptance and trust. For many participants, the “Changing the world, one heart at a time!” project serves as a beginning of a friendship with some intellectually disabled persons.